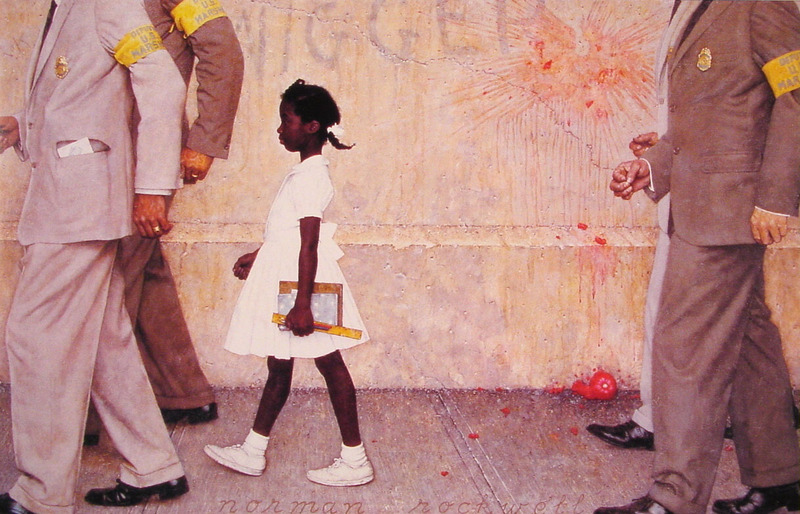 When you imagine Norman Rockwell’s America you don’t usually think of it as a segregated one, but it was. And when you remember Norman Rockwell, you don’t typically recall an influential civil rights artist, but he was. Or so I discovered at the Norman Rockwell Museum in Stockbridge, MA. While the rather small museum displays only a tiny fraction of Rockwell’s reported 4,000 works, many of which were lost to fire, it contains some of his most famous. Within its walls, visitors will find the hopeful and entertaining paintings like Runaway, Going and Coming, and Freedom From Want, that are most associated with Rockwell’s 47 year career as a Saturday Evening Post illustrator. 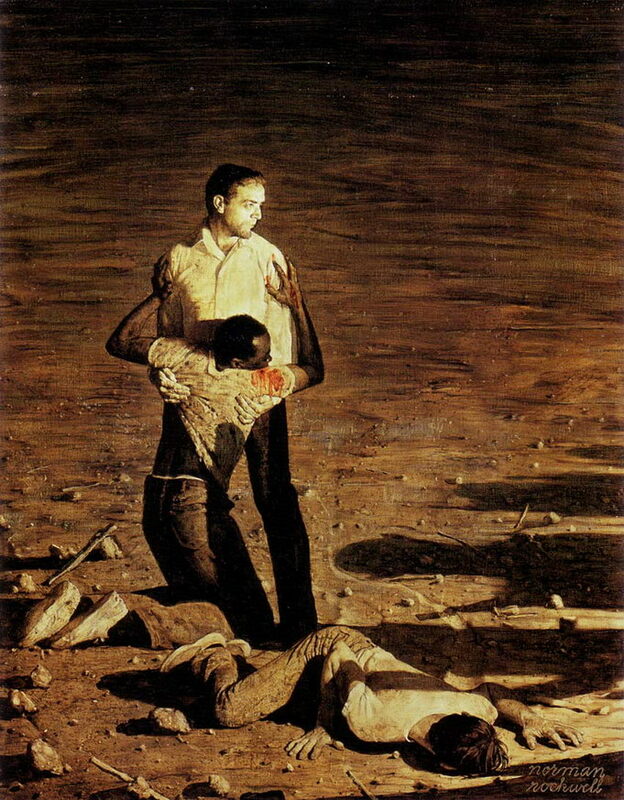 But they’ll also find the more serious, and powerful work of Rockwell’s later life when, after leaving the Post, he turned to topics of civil rights and poverty. It was these images I found most intriguing and surprising. I’d always known that Norman Rockwell was a good illustrator. At the museum I discovered he was a good man as well. I went to an exhibit of Rockwell’s works in Washington D.C. a few years ago and I was stunned. He was so much more than the ‘mere illustrator’ some critics have labeled him. If you get to Pittsburgh on your wanderings, you must go to the museum dedicated to that other illustrator, Andy Warhol. This museum is truly amazing! I loved it. I have loved Rockwell,and his work all my life. Have a few prints of his hanging in my house. I spent the whole afternoon looking around the museum. However, I couldn’t get into the studio, because they closed it. I was so disappointed. They even had the trail closed, so couldn’t even look into the windows. Guess that means I need to go back, eh? I had supper at THE RED LION INN that Rockwell went to often,and he had done a painting especially for them,and signed it for them. It was so cool! This was after spending the morning at the Emily Dickinson Home in Amherst, then driving (like a maniac!) across the state to see the mountain,and to tour Herman Melville’s home! More on that blog! The studio was neat but I can’t say I’d recommend a second trip back if that is the only draw. Instead, maybe you could go to the Rockwell Museum in Vermont, unless you’ve already been their too. Thanks, Brian. No, I have not been to the museum in Vermont. I would love to someday. My inlaws were there, and were’t impressed, but you have to understand these are people that stood across from Anne Frank’s attic annex in Amsterdam,and skipped the tour,and also stayed in a hotel across from Mark Twain’s red house in Hartford, Connecticut,and felt it was a “cute” house, but not worth taking the time to tour! LOL!